Certain diuretics, antidepressants, drugs prescribed for Parkinson’s disease, alpha and beta blockers may cause the blood pressure to dip. Postural/orthostatic hypotension: It is the sudden drop in blood pressure on standing up, after a long resting posture. Ideally blood pools in the legs in response to gravitational force and the heart rate and blood vessel constriction are increased to counter balance this effect and ensure sufficient blood supply to the brain. However, in this form of hypotension the counter-balance mechanism fails and the brain experiences a shortage of oxygen nourishment leading to dizziness, headaches, and black-outs. Prolonged bed rest, pregnancy, burns/excessive heat, cardiac complications, and varicose veins, can also be causatives of orthostatic hypotension. This form is common among the elderly and the drop of blood pressure is evident in most cases early in the morning, as researched by Weiss and co-authors in 2003, through a study. Post-prandial hypotension: This one is rather common and often experienced by the elderly adults after a meal. The blood pressure dips due to failure of response mechanisms that need to increase the heart rate. Individuals with autonomic nerve disorders or hypertension are usually vulnerable to this form of hypotension. A study presented by Ong and co-authors in 2014 suggests that medications are effective in prevent post-prandial hypotension, but unfortunately not as significant in symptomatic cases. Neural hypotension: This type attacks most young people who stand for a prolonged duration. It is a result of the left heart ventricle signaling the brain that the pressure of the blood is high, in response to which the blood pressure is lowered. Gradually blood accumulates at the legs and begins to cut-off supply to the brain itself. Multiple system atrophy (Shy Dragers Syndrome): Caused due to a nervous damage leading to orthostatic hypotension in combination with elevated blood pressures while one is lying down. The best way to diagnose a low blood pressure is through blood tests, electrocardiograms, and echocardiogram that will aid in assessing the heart structure, function, and rate. The valsalva maneuver, stress tests, and the tilt table tests are also helpful. Hypotension can largely reduce oxygen availability required to carry out normal physiological functions and hence, it is not going to be a good idea to ignore it. Increasing fluid intake, consuming small frequent meals low on carbohydrates, increasing sodium sources in the diet, wearing compression stockings, and adhering to prescribed medication routines is helpful. Hatt, G. (1992). What is low blood pressure?. The Lancet, 339(8800), 1049. Grayson, C. E. (2002). 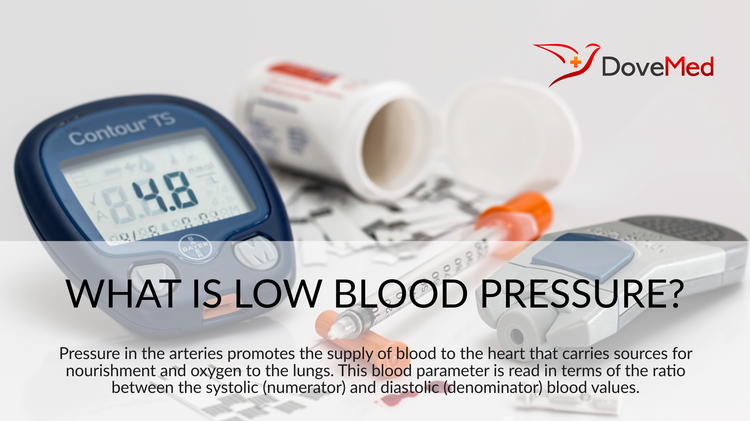 What is low blood pressure?. Hunterdon Healthcare System. Aug.